These spells were inspired by hold person, protection from evil, geas, invisible stalker, light, cloudkill, contact higher plane, and conjure elemental. An element of Death Frost Doom informed covenant. I might give sorcerers that start with conjure the true name of a 1 HD minor demon. See spells without levels for more information about this project. Some spells make use of sigils. A sorcerer may only ever have one sigil of a given type active at a time and the creation of a new sigil causes any previous sigils of the same type to vanish. Summon invisible, extra-dimensional chains. A number of hit dice worth of creatures equal to the sorcerer’s level may be bound, and saving throws apply. Bindings may be set as traps by laying a binding sigil. Supernatural creatures of HD less than or equal to the sorcerer’s level may not cross or disturb the circle boundary. A number of people equal to the sorcerer’s level may shelter within the circle. The circle must be drawn prior to casting, is immobile, and lasts until the circle is broken. Magically seal a bargain between the sorcerer and a counterparty by awarding temporary control of both souls to a devil. Free assent is required, but may be compelled by factors external to the magic (such as a dagger to the throat). Demonic malady rewards temporary deviation, and ignoring the covenant completely allows the devil to take permanent possession, which causes death (and eternal torment). Conjure forth a demon and negotiate terms (part of payment is always the soul of the target). The sorcerer’s sigil must be set upon a possession of the target. The demon will then hunt the possessor of the object the sigil is set upon until the possessor is slain. Conjure a hovering insubstantial spirit of radiance that does not shed heat, does not require air, is not doused by water, and may be maintained with concentration. A number of gleams equal to level may be summoned and the illumination of each is similar to torchlight. Gleams may be directed to bedevil enemies, which will cause temporary blindness (if a saving throw is failed) as long as the spirit remains engaged. Summon the poisonous atmosphere of hell. 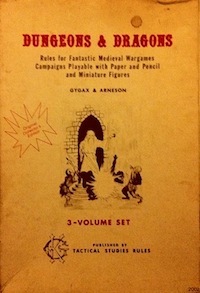 Determine effect randomly: 1) save or die if breathed 2) one die of acid damage per round and vulnerable objects must save 3) burning blindness permanent until treated with salves and poultices 4) uncontrollable retching which imposes a -4 penalty and prevents complex actions such as spell casting 5) one die of cold damage per round and any killed in the miasma rise as uncontrollable ice revenants 6) the stench of chaos requires all within to save or go berserk, attacking randomly any within reach. The miasma follows the wind, but otherwise seeks to descend back to its place of origin. Query a creature from another dimension. If a particular true name is known, it may be intoned during the casting of this spell, and the named creature will answer, otherwise determine the entity randomly (such as from a table of demon lords). Answers are not guaranteed to be truthful, and entities will usually attempt to further their own interests. Call a creature from another dimension. 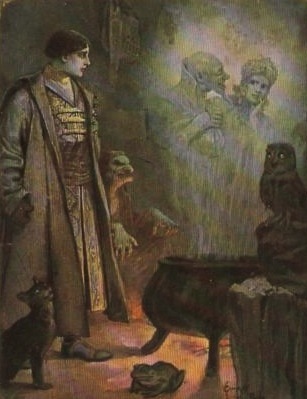 If a particular true name is known, it may be intoned during the casting of this spell, and the named creature will come, but the veil may also be rent without care for what will emerge (determine entity randomly, either by rolling 1d20 for HD and making up the other details or by using a table of creatures from other dimensions). Sorcerers may control any conjured entity of hit dice less than or equal to the sorcerer’s level with concentration, but otherwise the standard reaction roll and negotiation procedures apply. This entry was posted in Rules and tagged magic-user, OD&D, spell, Wonder & Wickedness on September 23, 2013 by Necropraxis. Neat. Aspects of Gleam seem a bit too strong though – you can keep a number of creatures equal to you level blinded for quite a long time if I’m reading it right. What if the spirit flares up and burns itself out in order to blind, so each one’s only good for a single save? Also were you thinking sigils would be visible without magic? Seems like it would be important to know in the case of Demonic Assassin. Re: gleams: that seems like a reasonable interpretation. You could also maybe give enemies a save per round to moderate the power. I’m not sure it would necessarily be all that strong though, given that blinding several enemies at once requires a higher level sorcerer. In any case, it seems less useful than sleep, but I should probably wait to see it in play. You might be right. Re: sigils: the way I would run it is that sigils would be visible to all and obviously arcane, but only recognizable (both in type and in ownership) by other sorcerers.